The principles of NIMS are incorporated into the University’s Comprehensive Emergency Management Plan and therefore affect emergency/ disaster planning, training, exercises, Communication & Information Management, Resource Management, and Command & Management. The entire University Community needs to be aware of NIMS to fully understand Emergency Management. ALL University personnel who have ANY role in emergency/ disaster mitigation, planning, response or recovery are required to complete NIMS training. There are four NIMS training tracks. 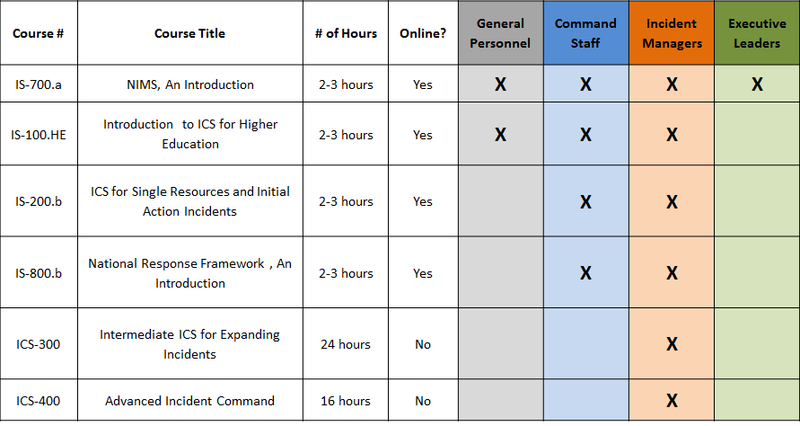 The specific emergency/ disaster role of each University community member dictates which training track they need to complete. NIMS training is facilitated through the University’s ULearn system. If you have an emergency/ disaster role and have not yet completed any NIMS training, please contact the Office of Emergency Management at NIMS@miami.edu. ULearn NIMS Certificates of Completion can also be emailed to NIMS@miami.edu for credit. If you have previously completed the necessary NIMS training, but do not have your certificates of completion, please print and submit this Transcript Request Form. Identify answers to the Final Exam Questions accessed in Step #1. Once Emergency Management receives the completion certificates at NIMS@miami.edu (with your name), you will be given credit in ULearn.